The Announcement bar is the sits above your store's header and is a great place to fill your customers in on new promotions, offers and important changes to your store. You can enable and customize the bar in the Header section. Marketing popups can be configured in Theme settings > Popup. Blockshop's has a popup overlay that can be configured to show a combination of an image, text, a signup form and social media icons. Blockshop's Page content feature allows you to import content from a page into the popup text area. 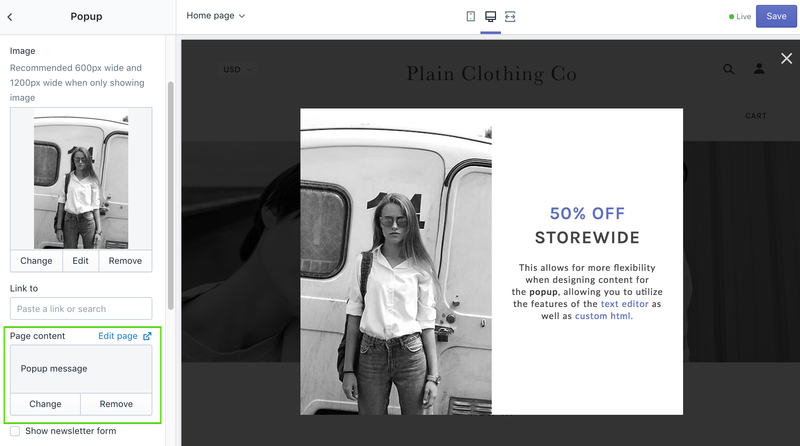 This allows for more flexibility when designing content for the popup, allowing you to utilize the features of Shopify's rich text editor as well as custom html. Maker and Local have a sticky horizontal popup, that can be configured to show a combination of an image, text, a signup form and social media icons. The display frequency range of the popup can also be set, which will be independent to each browser and device. The Test mode option allows you to test out the popup when designing and will launch on a page refresh. Read more about setting up mailing list/newsletters.